Sierra Leone’s Presidential Flag-bearer aspirant for the opposition Sierra Leone’s Peoples Party (SLPP), Dr. Kandeh Kolleh Yumkella has arrived in London to attend the British government’s launching of its ‘Energy Africa Campaign’. This news comes as Britain today signs a £30 billion investment deal with the Chinese government to build nuclear electricity plants in the south of England. Dr. Yumkella will join UK’s Minister of State for International Development – Grant Shapps for the official launch of the DFID led Energy Africa campaign. The event will be hosted by the Shell Foundation tomorrow, Thursday, 22nd October 2015. The British government is expected to contribute an initial investment of £30 million ($46 million) to tackle rural energy poverty in Africa. 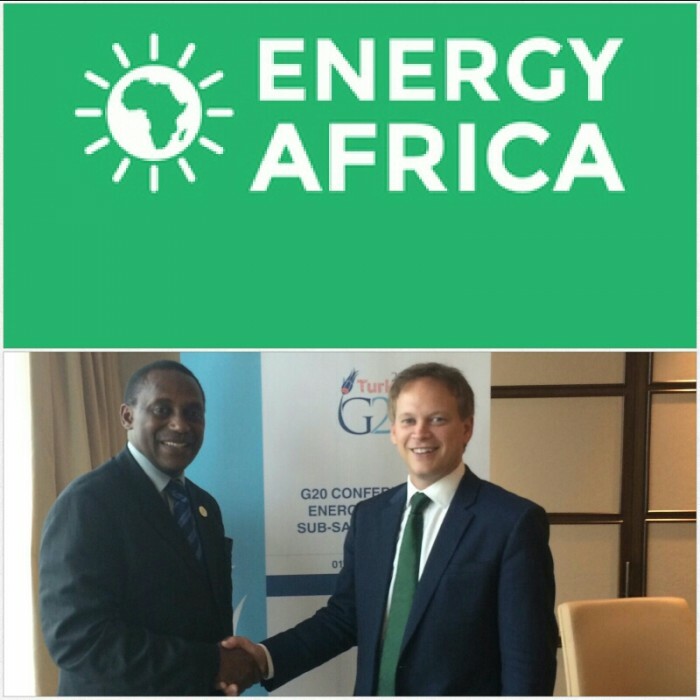 Kandeh Yumkella and UK minister Grant Shapps (Photo) were both at the Turkey G20 summit where they discussed the need for a co-ordinated and concerted longterm programme for the development and provision of renewable energy for Africa. The editor of the Sierra Leone Telegraph – Abdul Rashid Thomas, put it to Yumkella that one of the key issues facing developing countries – especially Africa, with respect to the debate about sustainable energy is finance, and sustainable energy does not come cheap. How is Sustainable Energy for All going to be achieved in Africa without new funding? Yumkella replied: “That was the core issue of the discussions at the G20 Summit.” He said that, “Africa needs over $40 billion annually to expand energy production capacity. We have a total of about 2 Gigawatts of power in sub-Sahara Africa and we need to raise that to about 6-8 Gigawatts in order to begin to achieve universal access to energy by 2030. 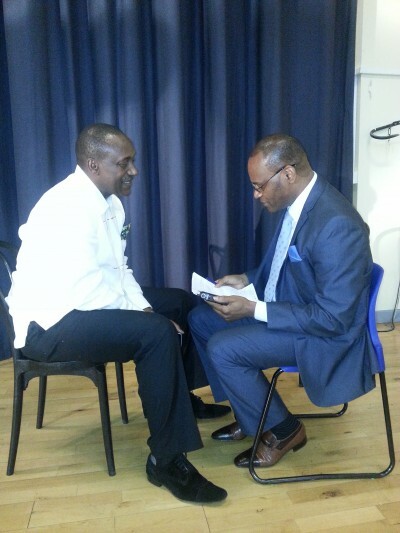 (Photo: Yumkella talking to Abdul Rashid Thomas in London in July, 2015). “In order to achieve this, as I said earlier we need $40 billion investment annually. Fortunately the new president of the African Development Bank (ADB) has also adopted energy as his number one priority, and he was very clear about this. “So you can see that my vision was correct ten years ago. This is what I have been lobbying the world about. The new president of the ADB has said that without energy, nothing will work in Africa. “The G20 has picked this up and they’ve asked me to put this agenda together and they will look at it when the heads of state meet in November. So we are hoping that big finance will come forward. Already the European Union has committed $2.5 billion for the next seven years. “This EU funding will leverage an additional $10 billion. So it’s not a bad start, but it’s not enough. And so we are hopeful, because China is the next Chair of the G20 and they will also take the agenda forward. “Obama has got the Power Africa, which is pledging about $32 billion. So there is a lot of work to be done to get to the $40 billion target that Africa needs to achieve universal access to energy. These pledges will be the seed corn that will lever the additional funding. “But what we need to know is that investment will not come, if we Africans do not put strong governance structures in place. Eighty percent of the energy utility companies in sub-Sahara Africa are bankrupt. 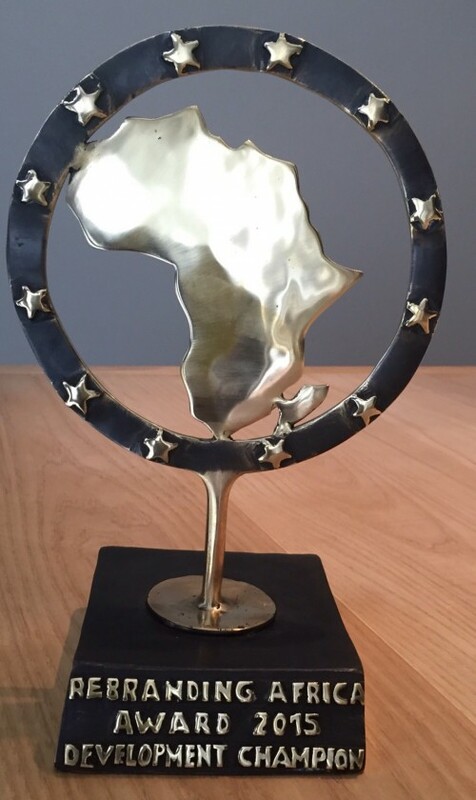 (Photo: Yumkella has been awarded the Re-branding Africa Trophy 2015). “And you can’t have any investor coming here to invest in independent power production if the power utility company cannot collect utility bills. You cannot ask investors to invest if the energy sector is not governed properly, and if the laws are not there to protect their investment. “So asking people to give money is one thing; having a conducive policy environment and the transparency and sector governance to give confidence to a private investor who wants to come to Sierra Leone for example, to build a new hydro-electricity dam that will generate about 3 Megawatts of electricity to power the country, will need to have the utility bills collected for over thirty years in order to recoup their investment. “I remain hopeful. I am an eternal optimist who believes that our governments understand that whether it is energy, agriculture, the health sector or education, you need clear and transparent public policy; you need clear and transparent sector governance structures; you need strong and credible institutions to manage those sectors, ” said Yumkella. 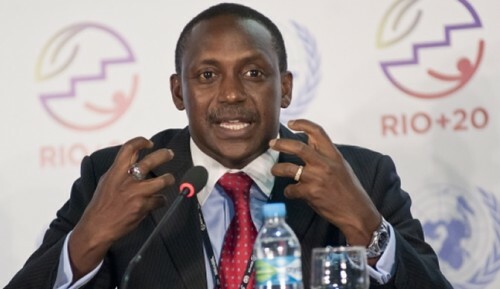 Kandeh also said that: “If corruption has consumed those institutions, people will not invest. So what are we going to do? In the energy sector in most African countries, there is too much corruption and that needs to change, otherwise investors will go to Asia where they will get a good and safe return for their money. “So we need to have clear energy policy, good investment protection laws that is strongly administered and policed; you need good power purchase agreements that will guarantee their return in investment, and consumers have to know that if you want reliable electricity you have got to pay. Tomorrow, the editor of the Sierra Leone will be talking to Dr. Kandeh Yumkella about the launching of the ‘Africa Energy Campaign’ – what this means for the $40 billion target that Africa needs to achieve universal access to energy. Dr. Yumkella will also talk about the SLPP convention that he attended in the USA last weekend. One would assume that Dr Yumkella, given his leadership skills and access to all global and powerful leaders, should now be in the position to have raised the kind of money he would generally need to start spending on his presidential campaign. I would expect him as well to be seriously engaging his global friends to help on his mission to change Sierra Leone if granted the vote. And for him to get that vote, he would have to spend big money to change mindset of those here in salone that are clinging on to primitive loyalty and mediocrity. Sierra Leone would be better served with the presidency of Dr Yumkella, given all that he has accomplished. But there are real political challenges ahead for Dr. Yumkella. He would have to first get the party’s nomination he is running under, and contest with many more who are determined to win at all cost, and who are also popular in their own realm. Dr. Kandeh Yumkella would also have to deal with an incumbent President who is good at manipulating the political space and institutions to his party’s and his own personal advantage. Should I be advising his campaign team, I would urge him to use his global influence behind the scenes to shake things in Sierra Leone. I would urge him as well to start spending money on his party without waiting on others. And he should put his foot soldiers on salary to sealing their motivation and commitment. The physical presence of Dr Yumkella is needed more at home – mingling with the people, than travelling around the world meeting with global audiences. Dr. Kandeh Yumkella may have the leadership qualities and competence to govern Salone, but I believe that his road to Salone’s presidency is littered with pitfalls. Instead of constantly globetrotting, Yumkella would do himself a lot of good if he stayed in Salone and allow the ordinary folks over there to get to know him better. It is the humble folks that win elections in Africa not the elites. How many SLPP politicians, chiefs or civil society guys know Yumkella? These are the folks that will be voting for SLPP’s flag bearer. I must say that I was leaning toward Yumkella, but it seems that if he does not change his strategy he will be heading for a big defeat. Dr. Yumkella is truly a statesman unlike Maada Bio the military junta leader who thinks he has what it takes to run a country. Bio and his ragtag junta rebels ran the country to the ground. Those whose wives and children and parents who were dehumanised by Bio and his boys will never forget. They plundered the country’s national bank and stole hundreds of millions of dollars. Now he wants to be given a chance to finish what he and his military junta started in 1992. Please Mr. Bio find something else to do with your time and leave governance to those that can be trusted because they have proved their capability. 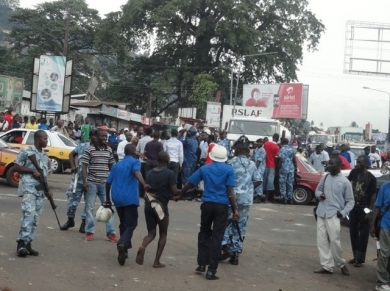 Yumkella has the leadership qualities and the competence to govern Salone. Juhanis E.N.Gathwa: The almighty GOD will answer our prayers and direct HE Bio the right way in Jesus name.